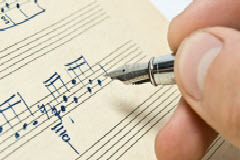 This course covers only the bare essentials of music theory. The course helps to explore basic music theory so thoroughly that the interested student will then be able to easily pick up whatever further theory is wanted. The main premise of this course is that a better understanding of where the basics come from will lead to better and faster comprehension of more complex ideas. The beginning musicians should go through this course. This intermediate music theory course will help the student understand how music is structured in relation to keys, intervals and rhythm. The course is built to provide step by step information in a logical and systematical way. This advanced music theory course provides you with a professional command of the mechanics of contemporary music. With this level of music theory, there will be practically no barriers between you and the music you want to create.